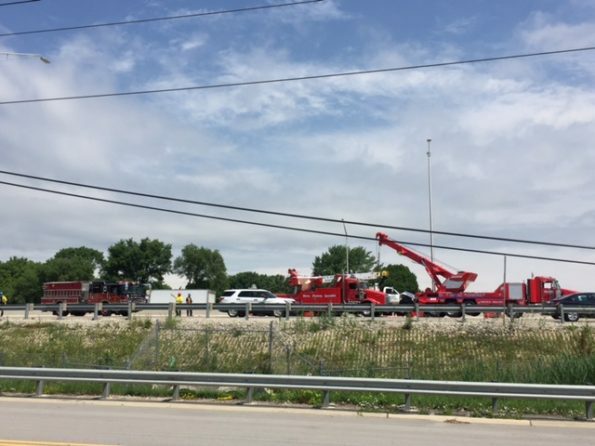 Illinois State police and Schaumburg firefighter/paramedics responded about 10:47 AM Tuesday June 19, 2018 to a report of a rollover semi-trailer truck crash with injuries, 42.061426, -88.059758 (Eb Interstate 90 and Meacham Rd Schaumburg) . Police and firefighter/paramedics received a report of a rollover semi-trailer truck crash with injuries and entrapment. The first Schaumburg fire crew on arrival reported a semi-trailer truck on its side with lane blockage on I-90 in both directions. The crash was also report on Waze. The crash involved a white arborist utility crane/truck and possibly a silver full-size pickup truck. Hillside Towing used two rotator/crane trucks to upright the rolled truck and clear I-90 for normal traffic. Rollover truck crash on EB I-90 west of Meagan Road.